One of the world’s cutest dogs – Wawa Ho from Las Vegas – has joined the field at Battle of Malta. Wawa Ho – more frequently known as Bella – belongs to American poker player Ting Ho and has already attended several events in her home city of Las Vegas. 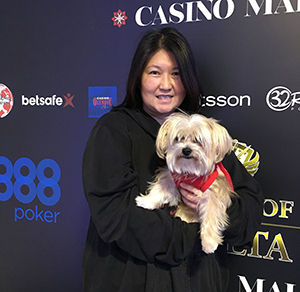 Now Wawa Ho is making her debut at a poker event in Europe; not only that but she’s a Maltese Terrier so she’s right here in her spiritual home. Bella, who turns 8 this month, is no stranger to the frenetic world of high-stakes poker and happily sat on Kristin’s lap throughout the 2nd Annual Chad Brown Memorial Poker Tournament at Planet Hollywood as well as many other events. Ting said: “Both Bella and I are incredibly excited about the Battle of Malta. This isn’t Bella’s first trip to Europe but it is her first live tournament here. She loves travel and goes everywhere with me. I’m playing the Main Event today plus Saturday’s Ladies Event, and the High Roller – and Bella will be coming along too.” Ting and Bella are in Malta with Ting’s boyfriend, WPTDeepstacks’ Player of the Year Rex Clinkscales. Pooches aside, a huge field is expected for this year’s Battle of Malta which has broken records throughout its six-year history. This year’s Main Event has a €1 million guarantee, with unlimited re-entries and four start flights. The Battle of Malta was awarded “Best Low Buy-in Tournament in Europe” in 2015.